You are confused by all the choices available to you and don’t know what to do to improve innovation in your company. You’ve invested a lot in digital technology to crowd source innovative ideas, identifying great solutions, but your organization has yet to commercialize any of them. You are still wondering how to rekindle your financial growth and bottom line. You are facing non-traditional competition, fast moving global trends, and disruptive technology and business models. Your best employees are losing confidence in the company’s strategies and worse, its leadership. You want to find a more comprehensive and long-lasting approach to improve the company’s innovation, while still maintaining a focus and excellence on current operations. Innovation is quite doable. It is measurable, manageable, and will drive results. You can transform your organization with the right information, direction, and culture. You can improve your innovation while still maintaining a focus on excellence with your current operations and financial obligations. If you don’t improve your innovation, you’ll fall behind and be eaten by your competition. Why do most companies fail with innovation? You’ve developed an innovative product or service, and put most of your attention on producing and delivering it. But what gets left behind is working on the business’ future. This includes staying close to customer and market changes, new technologies, socio-demographic changes, and the early signals of the next big thing. Most importantly executive leaders fail to speak to the importance of innovation, set a strategic vision for it, and invite their workforces to be innovative. This happens to all companies. But at a certain point, if you don’t develop a culture, systems, and capability for innovation, you reach your limits to growth. You need to make a commitment to drive and manage innovation. Innovation is tangible. It is measurable and manageable. Research shows that innovation is highly correlated with both competitive positioning and financial performance. A Boston Consulting Group survey revealed that 64% of senior executives agreed that innovation is a top strategic focus for their firms. 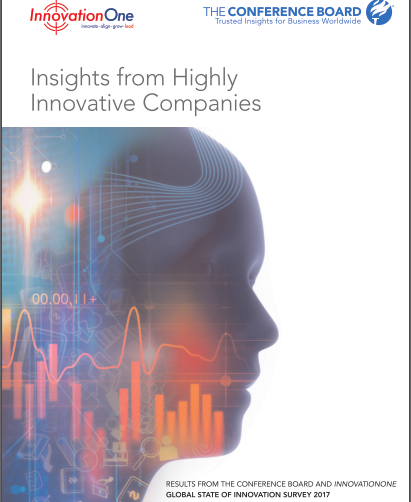 The research of Booz and Company shows that organizations with a focus on innovation have profit margins 22% higher than bottom quartile performers. Rarely does a game-changing idea emerge from the strategic planning process or from the thoughts and ideas of one employee. Rather, they originate from a culture and infrastructure that encourages ideas across the organization and its external ecosystem. These opportunities for innovation lie at the margin, an interface of employees interacting with customers, value chain members, external experts, and competitors. 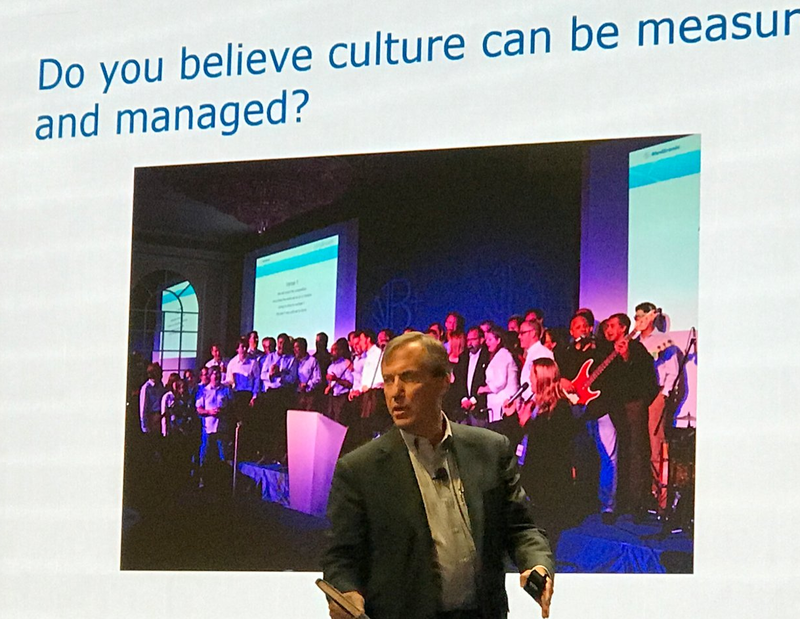 The key to innovation in organizations resides in the ability to define, instill, and reinforce an innovation vision, culture, and capability among your employees and your external ecosystem. Innovation will only flourish in dynamic, collaborative cultures lead by leaders who articulate a strategic vision for innovation, and invest in it. The investment includes putting in place the training, systems, and processes for ideation and knowledge management, and organizational processes to successfully commercialize the best ideas. Through almost 20 years of research, InnovationOne founder C. Brooke Dobni, PhD., has developed the InnovationOne Health Index (IHI), the most robust, quantitative diagnostic tool to assess, measure, and benchmark innovation culture and capability. Based on his landmark Fortune 1000 Study: “Innovation Nation? Innovation Health Inside the Fortune 1000,” Dr. Dobni has identified the six common traits of highly innovative organizations. 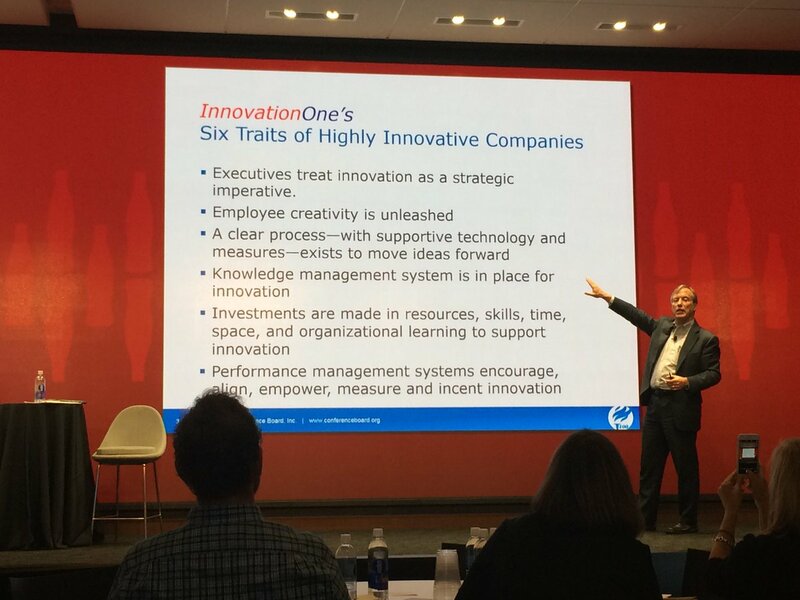 Victor Assad presenting The Six Traits of Highly Innovative Company’s (based on InnovationOne’s research, at The Conference Board’s 5th Innovation Master Class in Atlanta, Oct. 4, 2017. Because of Dr. Dobni’s empirical research and our practical experience, InnovationOne can provide practical guidance on how every organization can improve its innovation culture and capability, resulting in sustainable competitive value and higher financial performance. helping you pulse, measure, and improve your progress along the way. We analyze the strengths and weaknesses of your culture and capability for innovation using the scientifically developed InnovationOne Health Index. Our analysis is extraordinarily thorough across the four organizational dimensions and 12 drivers of innovation. (See the circle diagram below). Because we have over 2,000 companies in our data base, we can compare your company’s innovation strengths and weaknesses with other companies in your industry, in eight different industry benchmark groups. We will work with you and your leadership team to understand the nuances of your innovation culture and capability, its strengths, and weaknesses. The results of this assessment will serve as an important benchmark to begin improving your innovation culture and capability–and measure your progress and future success. Based on your results, we will work with you to put in place a detailed plan that will give you the clear direction for action to take in the first week, the next quarter, and the rest of the year. We work with CEOs, executives, and senior leaders who see the big picture challenging their organizations. They realize that only a comprehensive approach to improving innovation will truly create a competitive advantage and improve profitable growth. If you would like to explore what options are open for you in igniting innovation in your organization, and are prepared to act now, I invite you to contact me to schedule a complimentary one-hour strategy session. We will discuss the opportunities and challenges facing your company, our assessment, and how we can assist you. The session takes about one hour and we can link-up either in person, by phone, or by videoconference with Zoom. Just contact me by phone (707-331-6740) or by email (VictorAssad6@gmail.com) to arrange the complimentary session. You will have access to six other valuable reports and to my webinars and talks on my Free Stuff page. Learn from our thought leading research and experience. Or visit the InnovationOne website to learn more. Sign Up Today at Free Stuff!